Despite its extremely brief "operational" life, the exotic North American XB-70 Valkyrie has earned a large cult following. 40 years later, it gets the full song-and-dance treatment in a glossy, 276-page hardcover book, packed with rare photographs. The first few chapters branch off to describe other interlocking projects. First up is the Aircraft Nuclear Propulsion project that languished from 1945 all the way to 1961. Chapter 3 is an extensive essay on the Republic F-103 and North American F-108 interceptors. Both were designed from the beginning to use interchangeable components with the B-70..
Chapter 2 lays down the history of post-W.W.II bomber development and the reasons behind General Lemay's desire for an all-B-70 bomber force. It also explains why the manned bomber was so heavily resisted at the time, and describes the Boeing and North American proposals. Chapter 5 covers the political wrangling that finally killed the B-70 and reduced production to two prototypes. Furthermore, it describes the assembly of the two aircraft, and the innovations required to overcome nagging flaws. Chapter 6 is the largest section, and covers the entire flight test program, from rollout in 1964 to the delivery of aircraft #1 to the USAF museum. Many close calls are described, and some were a doozy. These range from landing gear failing to extend or retract, to sections of the outer skin being ingested by the engines. The tragic mid-air collision that killed Joe Walker and XB-70 co-pilot Carl Cross is described in depth, those the authors don't place blame on any one individual or organization. The complete summary accident report is included instead. Chapter 7 offers a good technical overview of the two prototypes and their systems. Everything about the Valkyrie was cutting edge; from the variable geometry air intakes, folding wingtips, stainless steel honeycomb skin, and a 4,000-psi hydraulic system, it resembled less a real aircraft, and more a Buck Rodgers spaceship. This chapter does an admirable job putting it all together. The final chapter was a bit of a surprise, as it covers the offensive and defensive systems planned for the operational B-70. It begins with a fascinating treatise covering the development of a working stellar-inertial navigation system, and how it was to be integrated into the finished aircraft. It continues on to detail the planned defensive systems, such as rearward-firing nuclear-tipped anti-aircraft missiles, tungsten pellets that could be sprayed at incoming missiles, and the bizarre "pye wacket" lenticular missile. The final part details electronic countermeasures, infrared reduction, the Skybolt ballistic missile, and the conceived "alert pod" ground power system. There are also several appendixes. The first is a log of all 129 flights, compiled by the NASA Flight Research Center. The second is an excerpt from test pilot Al White's previously unpublished Flight Test Summary Report. A third reproduces Fitz Fulton's (another xb-70 pilot) essay Lessons For A Supersonic Transport. Finally, there's a list of "interesting facts" from various press releases on the aircraft. As with all of Jenkin's books, this title is profusely illustrated. I must give the authors credit for their research skills, considering that much of the documentation has been lost after 40 years and two mergers. All photographs are reproduced at high resolution and are, for the most part, quite clear. Many were unknown to me up till now, particularly the three-view drawings of the early Boeing concepts, as well as most of the operations manual graphics. Tony Landis has provided many three-view artworks of the xb-70 and the F-108, and there are quite a few computer-generated artworks created specifically for this book. In total, there are about 500 photos (about ~70 in color) and dozens of illustrations. I have no doubt that modelers will eat up the numerous images (some in color!) of the aircraft under construction and undergoing maintainence. Though still highly technical in nature, this book was a brisker read for me compared to Jenkin's earlier work. Typos and editing gaffes have been reduced, with one notable exception. As an engineer, he refuses to indulge in partisan ranting (there's nothing quite like a good aviation history ruined by a political polemic). 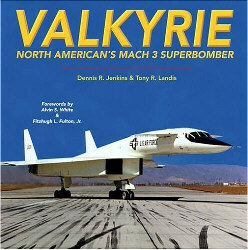 As far as I know, no serious attempt at a full technical history of the Valkyrie has ever been published. The authors have succeeded with flying colors and have raised the bar quite high for those writing their own books on the B-70. This is simply one of the best single-aircraft histories published in the last few years.